Posted in Bright Ideas / Webinars on February 15, 2019. Spam is taking over Google My Business, damaging rule-abiding local businesses’ chances of appearing in the local pack due to spammers gaming the system. This epidemic of fake listings, keyword-stuffed business names, and falsified reviews affects local businesses everywhere, and it’s up to local marketers to set businesses straight. 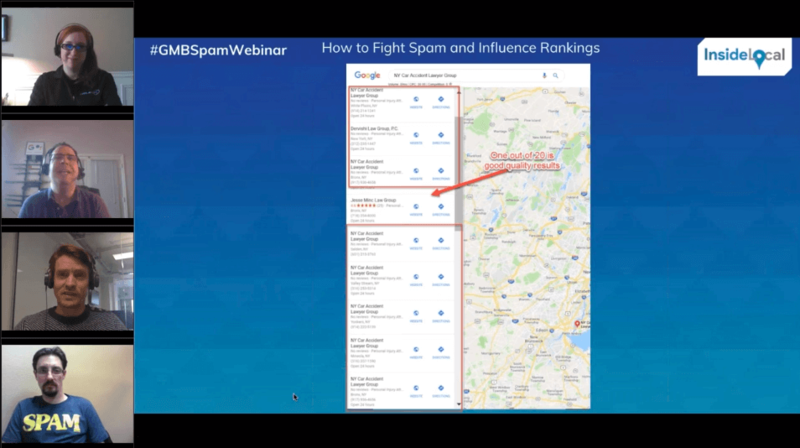 In our ‘How to Fight Spam and Influence Rankings’ webinar, Myles was joined by Sterling Sky‘s Joy Hawkins, Steady Demand‘s Ben Fisher, and Over The Top Marketing‘s Jason Brown. If you missed it, the webinar recording is available to watch below. We’ve also written up a summary of our favorite insights. What is Google My Business spam? Ben shared an example of a business with a keyword-stuffed name. Why is Google My Business spam a big problem? What do Google Product Experts do? 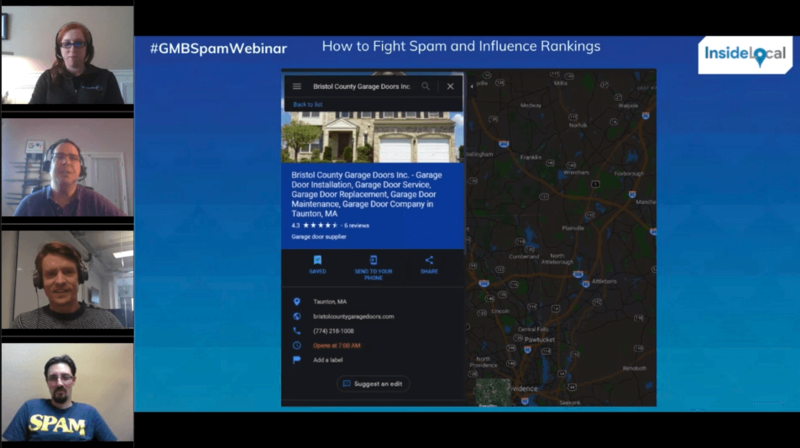 What impact does GMB spam have on local search results? Myles shared the findings of a recent BrightLocal poll, where 77% of respondents told us that GMB spam makes it more difficult for local businesses to rank. Which tactics are effective for cleaning up listing spam? How do you report GMB spam? You can only report spam via the Google My Business Forums, Twitter, and Facebook. Joy warned not to report spam through phone or chat support, as they won’t talk to you about anything unrelated to your own business. Ben recommended focusing on one channel, rather than confusing matters by reporting across all of them. Ben explained the differences with the social support channels: “They are going to tell you immediately, ‘Thank you, we’ll escalate this to our back end team. But, we are not going to be able to tell you anything about the results because you don’t own the account.’ So this will have to be something you’re going to have to monitor by yourself.” However, on the forum, you’ll receive a response. “If you have my permission to tag me that’s fine, but otherwise don’t do it,” said Ben. “Product Experts are not Googlers, and it’s not our product. I wish I could remove all the spam for you at the click of the bottom, but I can’t,” says Joy. For a step-by-step guide to reporting spam, read Sterling Sky’s ‘Ultimate Guide to Fighting Spam on Google Maps‘. 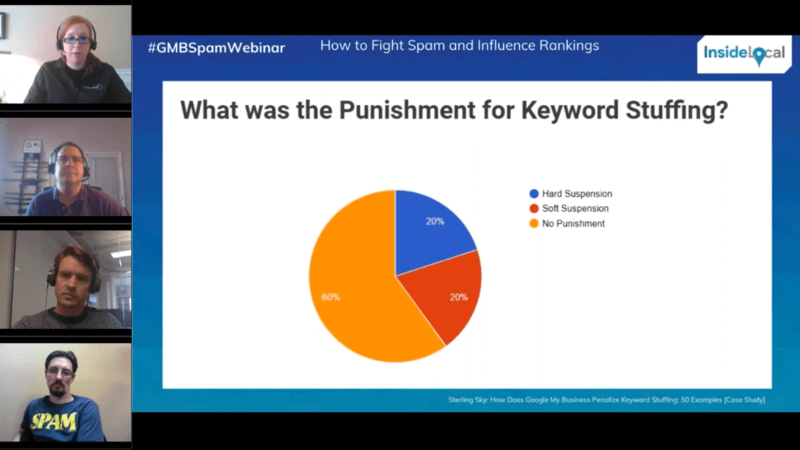 The panel went on to discuss a case study written by Sterling Sky, ‘How Does Google My Business Penalize Keyword Stuffing‘, that explores how many times listings got reinstated before disappearing. Jason discussed Google My Business and franchises. “We had one case where Google emailed all the users associated with a couple of listings that warned against illegal activity. In another example, a Google employee told me that adding a certain user to the account would cause the listing to get suspended. Google’s fully aware of who’s involved in doing well. We’re always preaching for people to do the right thing, as what you’re doing for your listing could have negative impacts for everyone involved. Should SEOs offer spam fighting to clients? Myles summarized the thoughts of the panel, “Incorporating spam fighting into the tactics that you use should be something that most agencies are doing, particularly if they’re working with industries where spam is prevalent. This is something they should be factoring into their playbook now in terms of what’s going to impact their customers’ positioning. It’s about how they pitch this in an overt way as a line-item, or if it’s just one of the tactics they operate under.” He then shared further stats from a recent BrightLocal poll on spam fighting. How will Google tackle spam in 2019-20? 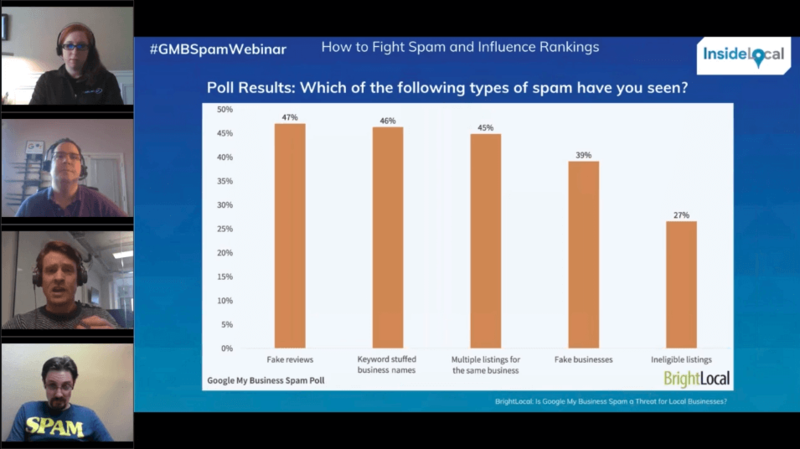 BrightLocal: Poll Results – Is Google My Business Spam a Threat for Local Businesses? BrightLocal: How Can Local Businesses Fight Spam in Local Results? Below are some of the highlights from the live Q&A. Thank you to Sterling Sky’s Colan Nielsen and BrightLocal’s Matt Coghlan for their answers below. You can follow Colan on Twitter here. Q. Is it considered spam if adding 1 keyword on the business name. Business is legit, has physical address and unique phone. For example “Rose Apartments in Austin”. Actual business name is Rose Apartments. Q. Since most of the spam GMB sites seem to be service-based businesses, with the address not listed, are you also seeing spam locations with their address published? Q. Do you feel that Real Estate agents with a GMB listing, using a cell phone number but use the broker address is spammy? Q. If I see a competitor adding KWs to their business name that aren’t in their official business title, what is the best way to report them and will they be notified that I was the person who reported them? I don’t want companies to see that I have reported them for abusing the guidelines and then come after our company. Q. How much attention is Google paying to review gating now? Is it grounds for account suspension? Q. When we report spam, how long should we wait before we escalate the issue? Q. Should a business listing on GMB correspond with what’s filed with the State Corporation Commission? Q. How can I identify identity spam? Is it from the name? What other things can we look for for backup? Maybe the website? Q. How should a home biz do a GMB if you can’t use your home address? A. If the home address is the official address you need to use that for GMB. The only alternative that can work is using the address of a partner in the business. Q. How can a business fight event spam (generated through schema markup) that is pulled into the knowledge panel? Joy Hawkins has been working in the Local SEO industry since 2006 and loves being a Google Product Expert. She also loves spending time managing Google AdWords accounts and has been certified in both Google Search and Display. She is also a speaker at various search engine marketing conferences such as SMX and LocalU, as well as the founder and owner of agency Sterling Sky. Ben has been helping businesses grow online since 1994 and specializes in local SEO. He is a hand-picked product expert, by Google, for his contributions to the Google My Business Forum. Ben is also a contributor to the annual Moz Local Search Ranking Factors Study and a regular contributor to BrightLocal. Jason Brown is the SEO Manager at Over the Top Marketing, and a Product Expert on the Google My Business forum, who spends his free time battling fake online business reviews with his organization Review Fraud.